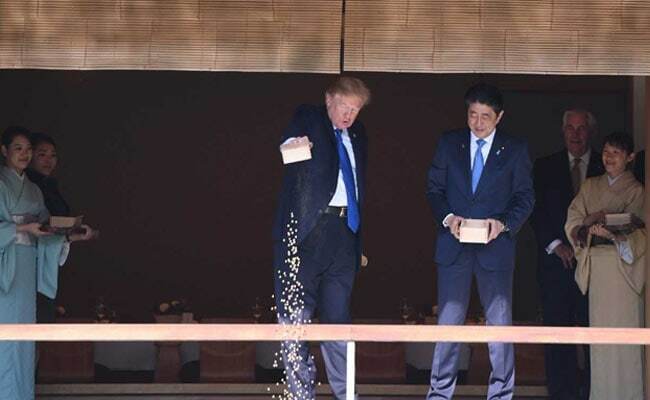 Tokyo, Japan: US President Donald Trump sparked a feeding frenzy on social media Monday when he was photographed dumping a box of fish food into a pond of koi carp during his trip to Japan. Trump and his Japanese host Shinzo Abe began by delicately spooning out the food into the pond to the waiting koi, which had been rounded up by a clapping Japanese aide. The US leader apparently lost patience with this method and upended his entire wooden box into the pond. The incident caused outrage among fish lovers on Twitter, with many pointing out that fish cannot absorb a large amount of food at a time. US Secretary of State Rex Tillerson, standing just behind Trump, appeared to break out in laughter at his boss's no-nonsense approach to koi feeding. But some uncharitable Twitter users were less forgiving, with several writing: "Trump can't even feed fish right." You proved my point. Trump has NO clue about what is tradition and custom in other nations. Dumping fish food is just the latest.